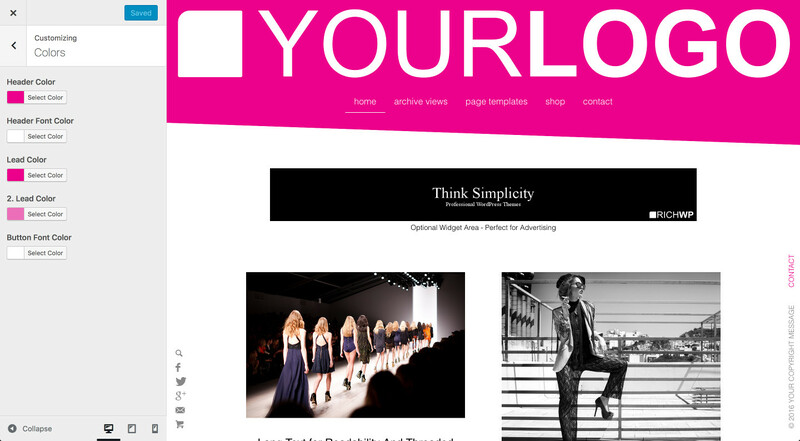 A truly modern WordPress theme - spread the love. Nothing beats the Rich Modern themes’ genetics. Are you looking for something fresh and creative? Elevate your site to something quite innovative. and hymn of praise about your site will be hummed. 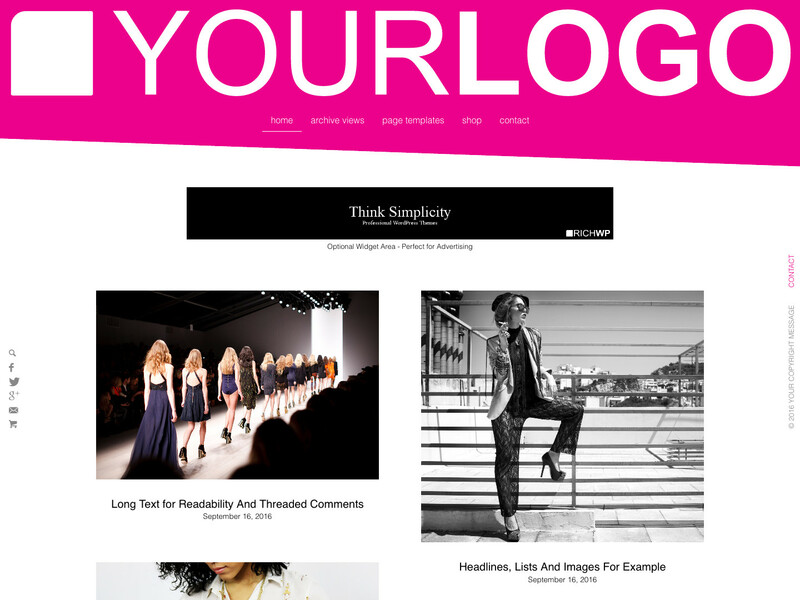 Are you looking for a modern, yet elegant WordPress theme to start a new project or revamp an old one? Do you want to stand out from the masses and elevate your site to the top of your industry? The outstanding design and professional coding of the Rich Modern theme is what makes this theme trump its competitors. If you are publishing in fashion, interior design, architecture, or any other design-related industry, then his theme is the perfect choice for you. Let’s start at the top. The header is big, bold, and will be noticed. Your logo is the centerpiece of your site, and by giving it the space it deserves, your brand recognition will build up. Below the logo, you find the centered, multilevel drop-down menu. You can keep your site organized, while your visitors will understand your site’s structure in a heartbeat. On smaller smartphone screens, the menu transforms in into an accordion style menu to be more easily controlled by touch gestures. All your articles will then follow in a two-column grid. New sets of posts are automatically loaded while the visitor scrolls down. This so-called “infinity scrolling” brings more content to your visitors’ attention without them having to take action and navigate a pagination menu—your page-views will likely increase as a result. On the left side, you will find the optional social icon menu to show your readers how they can connect with you. The footer, copyright text, as well as menu have been moved to the right side. It is a nice and clever twist to the overall design and also serves the purpose of making the footer accessible because the infinity scrolling would push a normal footer further and further down and make it basically unreachable. Once you click through to the detailed post view, you will notice the sidebarless layout. Due to the rise in mobile traffic, the majority of new layouts in the world of modern web design have gotten rid of the classical sidebar. Thus your content is in focus and will get the attention it deserves. However, that does not mean that we don’t have space for widgets anymore. We strategically placed several widget areas throughout the layout, which you can use to display advertising, insert email signup forms, and more (see demo). The Rich Modern WordPress theme is big and bold, but each design element has been crafted with a love for detail. Let it be skewed header border or the finely calibrated typography, we make sure that you will make a good first impression. Your header does not need to be pink. Change the background color of the header as well as the text color in the theme customizer to make it fit your unique brand identity. See demo 1 and demo 2 to see how a simple color change will completely change the characteristic of your site’s overall design. Of course you can upload your logo, and it can be displayed in a prominent way. Should you choose to, you can let it span almost the whole width of the screen, and since the Rich Modern theme supports .svg logo images, you can be assured that your logo will always be crisp and sharp no matter what device your site is being viewed on. Doing more with fewer options is the philosophy behind the “Professional Simplicity” motto of RichWP. Chances are that, sooner rather than later, you might want to add a shop to your site to sell products with your own label or cash into your blogging success with an affiliate marketing strategy or drop shipping set up. The Rich Modern WordPress theme has you covered. 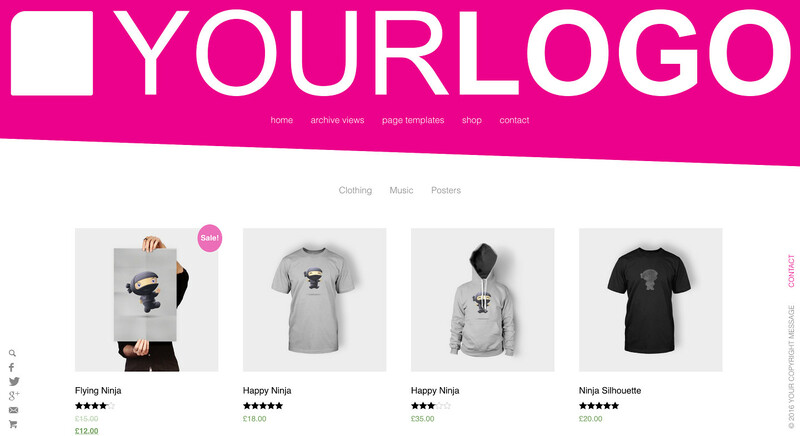 WooCommerce, probably the best WordPress ecommerce plugin, has been deeply integrated into this theme, so all your ecommerce needs will be covered. From a technical point of view, the Rich Modern template is actually as modern as it gets. The theme has been built upon Foundation, which is one of the most advanced front-end frameworks available. Combine this with over a decade of experience in WordPress theme development and you will have a combination you can trust and build your online success upon. Code quality gives you an edge over the competition. That is why our code is lean, fast, and well structured. Search engine bots will have no problem analyzing your content and knowing what it is all about. Felix has been wonderful. The theme is clean and easy and he is alway there to help answer my questions so that my creation looks as good as his demo. Highly recommended. We stand by your side. You either know already that this theme is the right one for you or you have a positive gut feeling that you should act on it. Imagine how your site would shine and rise to the top of your industry. Get the Rich Modern WordPress Theme now! Installing the Rich Modern Theme is as easy as it gets. Check the Installation & Setup Guide no need to break into a sweat. Get your site elevated with the Rich Modern Theme today. Your success will be accelerated. It′s your turn to make headway!